The myth of neutrality and the contested space. Posted on Monday, December 2nd, 2013 at 9:24 pm. Everyone’s mind and heart is a contested space. Society has a vision of “the good life” and Christianity has an alternative and competing one. Who will win the hearts and minds? We have to communicate the alternative vision of “the good life” – Gods plan for human flourishing and in such a way that people hear it as life affirming, redemptive and gracious. The Grand Vision and the Great Dream – The future of the Nations. Posted on Friday, October 25th, 2013 at 7:05 pm. : The strategic importance of ethnic church planting in multicultural Australia. : The dangers of the cultural trap. : The unity of the body of Christ. : God’s plan for the healing of the nations. We sometimes forget that almost all of the first Christians were Jews, the twelve disciples were Jews. It is also easy to forget, at our distance from the first century, the cultural challenges they faced in embracing the Gospel. The second Temple Judaism they were raised in had become narrow, inward looking and exclusive. The very design of Herod’s Temple itself bore witness to this. Surrounding the Temple proper was a great courtyard known as the courtyard of the Gentiles. This is where Jesus took his radical action against the money changers and sellers of animal sacrifices. Within this courtyard, separating it off from the Temple itself, was a stone balustrade on which were inscribed words in both Greek and Hebrew that forbade any non-Jew, on threat of death, from entry to the Temple courts. This was not in the original design of the Temple given by God in the OT and was certainly not exactly welcoming to a non-Jew! This was the Judaism in which the first Christians were raised. Right up to the time of Jesus’ ascension the disciples were still asking “Lord is this the time when you will restore the Kingdom to Israel?” Their view of the Kingdom was restricted and ethnocentric. It took the dramatic power and work of the Holy Spirit to break them out of their narrow ethnocentrism. Then there is the fanatic Pharisee Paul who led a campaign to purge the new Christian sect from Judaism. He is confronted by Christ in a powerful and extraordinary vision on his way to Damascus to persecute the Jesus followers there. Thrown to the ground and struck blind he hears Christs voice questioning him, he is later healed by one of the very people he came to arrest! Dramatically converted, he is then called to be the primary messenger to the Gentiles, his life turned completely upside down. Think about the infant Church, very early on in their care for the poor widows in the Jerusalem church. Acts 6. records that the Hellenist or Greek speaking widows complained because they were being put last in the queue for assistance, the Jewish widows were being given preference! Then in Acts 15 they have a major conflict over how much of the Jewish law the new Gentile converts should follow. They call what must be the Churches first council of leaders to resolve the question. Just like us they didn’t find it easy to overcome ethnic and cultural prejudice, a prejudice reinforced by the first century theological exclusivism they had grown up with. Remember also they were members of an occupied country trying to preserve their culture against the overwhelming homogenising force of the Roman Empire, at that time the greatest imperial, economic, cultural and military power the world had ever seen. It was like the way many Christians feel now in Western culture in the face of Post Modernity, aggressive secularism and the popular media as we struggle to preserve our identity and values and our children’s faith. But to reach the nations (‘all ethnicities’) the Gospel had to be brought to them in their own heart languages, they had to hear it in their own tongue. The day of Pentecost is a dramatic expression of their new mission and its international, interracial, and intercultural scope. The Christian faith is essentially relational; it is about entering into a personal relationship with God through Christ, loving God with all our heart…and our neighbour also. And so to understand it properly we need to hear it explained it in the language of our hearts, our own relational language, our own tongue. That is why Christians have worked hard at the task of the translation of the Bible and the Gospel into people’s heart languages. To date we have translated the Gospel into 2,798 different languages. There are 518 complete translations of the Bible and the work continues through the Bible Society, Mission agencies and Wycliffe Bible Translators. This work of Khalila’s that we celebrate and dedicate today is part of that great tradition, a tool to help one culture speak to another about Jesus in their own tongue. Nevertheless in spite of our positive history in the work of translation we should never underestimate the power of language and culture to trap us and limit us. Judaism has a sacred language – Hebrew. Islam has a sacred language – 7th C Arabic. But Christianity has no sacred language and yet at times Christians have forgotten this. The mediaeval Church and its scholars trapped the Bible in Latin and it took the courage of people like Wycliffe and Luther to break out of that and put the scriptures back in to the language of the ordinary people. Some Orthodox traditions have trapped their liturgy in forms of Slavonic, Georgian, and Greek that people no longer speak or understand, a dead language has become sacred! They have even developed a whole theology of worship to justify this as a heavenly language of worship. The divine service of the communion of the saints united with the heavenly worship by the use of a special language that transcends the divisions and limitations of living earthly languages. This special language is of course generally only known by the priests. While this idea contains an insight about our unity in Christ the cost of this to evangelism and generational transmission of the faith has been very high for many branches of Orthodoxy, with whole generations now missing or with little understanding of their faith because the language of their worship is not understood by them. There are also Anna – Baptists who today still use old High German in their worship, a language no longer generally spoken. When I trained for the ministry in the 1960’s Anglicans were still stuck with the Elizabethan English of the Book of Common Prayer and the King James Bible, beautiful but no longer spoken except in Shakespearian theatre companies! Kenneth Bailey in his classic commentary “Jesus through Middle Eastern Eyes” makes this insightful observation on Jesus’ use of every day Aramaic when he taught his disciples to pray. “The Lord’s prayer begins with the Aramaic word ‘abba’ and therefore we can assume that Jesus taught his disciples to pray in the Aramaic of daily communication rather than the classical Hebrew of written texts. The Aramaic – speaking Jew in the first century was accustomed to recite his prayers in Hebrew, not Aramaic. Similarly, Muslim worshipers always recite their traditional prayers in the classical Arabic of seventh century Arabia. Both Judaism and Islam have a sacred language. Christianity does not. This fact is of enormous significance. The use of Aramaic in worship was a major upheaval in the assumptions of Jesus’s day. It meant that for Jesus no sacred language was ‘the language of God.’ Jesus lived in a world where the public reading of the Bible was only in Hebrew, and prayers had to be offered in that language. When Jesus took the giant step of endorsing Aramaic as an acceptable language for prayer and worship, he opened the door for the New Testament to be written in Greek (not Hebrew) and then translated into other languages. The primary task of the Church is mission – to speak the Gospel to all the nations. That is why communicating the Gospel in peoples heart language is a strategic priority for the Church. It is also why ethnic Church planting in our multicultural Australia is a strategic priority, especially at this time when we are experiencing major immigration of people from very different cultures and language groups. But even within this strategy we must beware of the cultural trap. Every ethnic church must eventually transcend its ethnicity and language and the culture that accompanies it and understand that it is part of something bigger, the international body of Christ and the communion of the Saints in which, as Paul expresses it in Gal 3:28 “…there is no longer Jew nor Greek, slave nor free, male nor female; for all are one in Christ Jesus”. We are saved by grace not race! Every ethnic church that is planted in a dominant host culture like Australia, whether Chinese, Korean, Iranian, Tamil, etc., must plan ahead for its young people whose life will be shaped not only by the ethnic church but by the host culture in which they will be educated and the new language and culture they will absorb. The ethnic church must be willing to embrace change in their worship style and music, and create parallel services and youth groups in the language and style their children will be immersed in through their school and popular culture. If they fail to do this they will lose the next generation, a sad pattern we have seen repeated over and over again in immigrant churches. This strategy must be insisted upon by the host churches from the dominant culture that initiate or assist ethnic churches to be planted under their sponsorship. This is not an easy task for immigrant churches who value the traditions and language of their cultures of origin, but when the main preoccupation of an ethnic church becomes the preservation of their language and culture they are on their way to spiritual death and irrelevance. They have lost the heart of the Great Commission. Of course it must be said that established churches in the dominant host culture can fall into the same trap when they become locked in a sub culture that has lost its relevance and connection with the main stream of society. Behind the command of Jesus in Mathew 28 lies the greatest dream of all, the brightest, most holy and most precious vision of all, which is the ultimate purpose of the Gospel – the reconciliation and unity of all things to God. This plan, that arises out of the heart of God’s love for his broken world, is to reconcile us to himself through Christ, and then with one another in a unity that will never again be broken by prejudice, fear, pride, racial ambitions, war and conflict. It will also restore to harmony the very creation itself from its brokenness, as Paul expresses it so majestically in Romans 8:18-28, and make us once again its responsible stewards. This great purpose will lift from us the judgement of confusion and division laid upon us at the Tower of Babel because of our vaunting pride and rejection of Gods authority, creating a rich unity in diversity. This is one of the great goals of the Kingdom of God. The great prophetic visions in the OT speak of a day when all the nations lay down their weapons, gathering in a great celebration of unity and peace. As we think of the people of Syria today in their suffering we long for the realisation of Isaiah’s vision and hope. And then the final great vision of the book of Revelation. “What does this mean?” This is a foretaste of the final fullness of the kingdom of God, the ultimate purpose of the Gospel, that one day God will unite all people from all nations and all tongues who have put their trust in Christ in a great unity of love and peace in the fully consummated Kingdom of God. Augustine in his book “The City of God”, written as the old order of the Roman Empire was disintegrating in the 5thcentury, describes the disunity, conflict and rivalry of the nations as the fragmentation of Adam. “Adam lies scattered over the earth…..he has fallen. Having been broken to pieces, as it were, he has filled the universe with his debris and disunity. However, God’s mercy has gathered together from everywhere his fragments and by fusing them in the fire of his love, he has reconstituted their broken unity.” The focus of that fire of love is in the cross of Christ. But now we, the disciple of Jesus, must be the anticipation of this unity in our life and mission, and a witness to the truth that we are saved by grace not race. Posted on Wednesday, September 1st, 2010 at 7:00 am. The inevitability of death for each of us and those we love. The freedom to make our lives as we will. Our ultimate aloneness as individuals. The absence of any obvious meaning or sense to life. Yalom is not a Christian but his insights about people and their basic issues are very astute. You may not be a fan of psychotherapy but Yalom is a penetrating and thoughtful thinker about the human condition. It is worth considering how one can shape evangelism and evangelistic preaching to speak to these needs and show the relevance of the gospel to them. There is no doubt that the gospel is relevant to them, the question is how to creatively connect with them in a way that is not simplistic or crass. It must be subtle and nuanced, almost approached obliquely. It is like the experience we sometimes have when reading a novel or story or seeing a film and finding deep inner feelings and thoughts stirred and touched. The aim must be to find common ground with the hearer, to connect with their experience, in particular their experience of the anxiety and pain that arises from the four givens of existence – death, freedom, aloneness and meaning. Use an inductive approach – begin where the people are. With the inductive approach the communicator begins with the life experience of the hearers and draws them towards concepts, principles and conclusions. He takes the hearers on a journey of discovery rather than beginning by announcing and asserting. Use your own experience. Tell your own stories about your existence pains. Use the stories from widely viewed films by tapping in to the experience people have had while watching the film e.g. ; ‘Do you remember the scene from Saving Private Ryan where Tom Hanks……..as I watched I felt this sense of …………..’ Powerful films tap into these existence pains as do good novels. From the Gospels show how Jesus speaks and relates to these issues e.g. : By retelling the story of the death of his friend Lazarus and Jesus’ obvious grief. The scriptures are full of the experiences of people struggling with these issues. Consider Moses in Exodus 33. when he tries to deal with his disappointment and anger at the people’s apostasy and to come to terms with whether he can continue to lead them, and if there is any point any way; or Hanna’s despair in 1 Sam 1. at not being able to bear a child and all that meant then for the significance and purpose of her life. Think of the process like a letter slipped under the door rather than a battering ram! Is the scream of the 20th century echoing in the 21st? Posted on Monday, December 14th, 2009 at 8:52 pm. Summary: Artists, writers, film makers and playwrights in the 20th C often reflected in their work a sense of alienation, of being alone in a hostile and dystopian world. There was a feeling of bleakness about the present and frequently an apocalyptic vision of the future like Orwell’s “1984”. Other examples are Colin Wilson’s “The Outsider”, Graham Greens fascinating but sad explorations of the dysfunctional interior worlds of his anti hero’s like the man in “A Burnt Out Case”. James Dean played to perfection the iconic outsider in the film “Rebel without a cause.” The existentialists like Camus explored the possibilities of finding meaning in decision and heroic moral action but, as in his novel “The Plague”, in the end it all seemed pointless, the plague won. 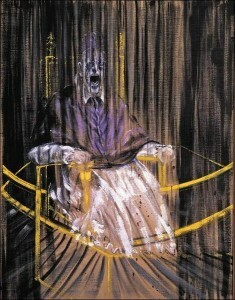 Francis Bacon’s paintings of a screaming Pope captured in disturbing images the angst of his contemporaries. Samuel Beckett’s play “Waiting for Godot” summed up the feeling of the times: we are alone in an unfriendly world and there is no point in waiting for God to turn up again, he is dead! The questions I raise in this essay are: has this sense of alienation continued into the 21st C, or have we become so used to the absence of God and any greater meaning and purpose to our lives that the mood has significantly changed, or are we just expressing the absence and aloneness in a different way, or have new anxieties like saving our ecosystems replaced the old ones, or has our tendency to use popular culture to distract ourselves from deeper questions accelerated as it has been made easier and more accessible by the electronic media? It seems to me that these are important questions for Christian communicators and educators. 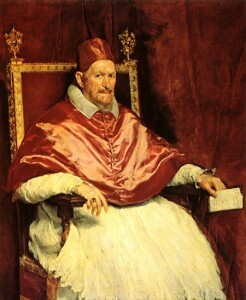 The 16th C Spanish artist Velazquez produced a large body of work, two of his paintings are The Crucifixion and the portrait of Pope Innocent X. Two 20th C painters, one English, Francis Bacon, the other a fellow Spaniard, Antonio Saura were inspired by Velazquez but produced images much more disturbing than his. They are images that express and reflect the twin anxieties of their times: the loneliness of the modern self and the horror of human violence and brutality. They had lived through the Second World War, the Jewish holocaust, the nuclear destruction of Hiroshima and Nagasaki, and Stalin and Mao’s totalitarian regimes. These two regimes brutalized thousands and forced the mass starvation and death of over 40,000,000 people in the Ukraine and China, the list goes on. Interestingly Bacon himself said very little about the inner meaning of his work with the exception of this comment: We are born with a scream; we come into life with a scream, and maybe love is a mosquito net between the fear of living and the fear of death. (2) This implies that his paintings were concerned with the individual’s struggle with the pains of existence, the struggle for meaning in the midst of living with the fear of life and the fear of death. Love provides a partial solace, but its fragile and gossamer nature gives but thin and brief protection for a short time. Artists like Bacon reveal with stark honesty the high cost of living in a reality that excludes God. Perhaps because of their sensitivity they are more willing to face and express the nihilistic implications of their loss of faith. Antonio Saura’s crucifixion series reflects the same themes. 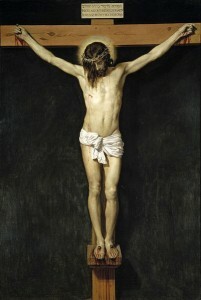 Saura’s crucifixion is confronting. I first saw it some years ago in an exhibition in the Victorian National Gallery called “Beyond Belief”. He painted a number of versions, the one I saw was in stark black and white. It is a very large painting and shocked me when I turned a corner in the gallery and suddenly came upon it. It captures not only the physical brutality of torture and death but the malevolence of the evil that is its cause. The figure is distorted to the point of transformation into that which caused its suffering. The violence and cruelty, the aggression and arrogance of human evil has become concentrated in the crucified figure. He has become what has afflicted him! Ironically, while Saura has created a brilliant graphic description and visual explanation of substitutionary atonement, according to the comment above, he sees in the crucifixion only the symbol of the terrible suffering man has afflicted on his fellow man. For me his painting does far more. It certainly is a confronting symbol of man’s cruelty to his fellow man – our tragic dilemma. But it also powerfully reveals the meaning of Christ’s death as the NT explains it, that he bore our sin and evil, became sin for us, that we might be forgiven and reconciled with God. Only by embracing this meaning are we able to be set free from the guilt of our complicity in the tragic dilemma. Only by embracing God the Holy Spirit are we able to find an inner transformation that can overcome the heart of darkness that is in us all and find in restored relationship with God, the answer to our sense of alienation and our despair at humanities condition. Over sixty years earlier the Norwegian artist Edvard Munch (1863 – 1944) painted his famous scream series that visually, expressed the beginning of Western culture’s sense of alienation, a feeling that was to become the constant dull ache of the twentieth century. Munch’s own life mirrored the risks as well as the spirit of his age. He was born into a deeply religious family but his mother and elder sisters died from tuberculosis, his other sister suffered from schizophrenia. This, coupled with his fathers religious fanaticism and mental instability, contributed to his loss of faith. He was also very influenced by the charismatic nihilist philosopher Hans Jaeger. In his pain Munch retreated into his art. 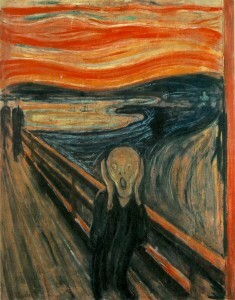 “The Scream” has become one of the most famous and recognizable images of the 20th C. constantly reproduced in prints. It frequently accompanies serious journalistic pieces on our contemporary angst’s and anxieties. Ironically it has even become part of the consumer clutter of our times appearing on coffee mugs, coasters and T shirts that add to the mountains of useless detritus we produce. If for a moment we were to pause and consider the absurdity of drinking a latte’ out of a mug with a picture that expresses horror at the futility and cruelties of our world, would we laugh or cry? Maybe this is a perfect Post Modern moment, full of irony and contradiction; it’s only meaning what we choose to give it! Perhaps this is the point at which we should come to the present and consider the question: does the 20th C’s angst and sense of alienation carry over into the 21st? There is a general uneasiness about the loss of cultural unity and identity, an anxiety about what is an Australian or French or English or Indian identity now. Multiculturalism, large scale immigration both legal and illegal from cultures with a vastly different world view are raising the old xenophobic fears. The so called ‘clash of civilizations’, international terrorism, and uncontrolled people movement are creating significant anxiety and one that people feel they can not express publicly. The British film “The Children of Men” picks up this theme with its bleak apocalyptic scenario of a Britain that is virtually an armed fortress against the avalanche of refugees from a Europe that has descended into chaos. A sign daubed on a wall reads- the future is a thing of the past. The South African film “District 9”, that describes the arrival of aliens in Johannesburg also picks up this theme and also raises the issue of the contradictory nature of humans. The treatment of the aliens by the Africans is a fascinating parable of a repetition of apartheid by the very people who fought to free themselves from the first apartheid. The same issue is being played out in real time now in Palestine. The scream of frustration at our inhumanity and stupidity goes on! There is also a deep unconscious dissatisfaction created by consumerism. The media marketing monster, inextricably entwined with popular culture, creates a constant desire for new acquisitions, something better than what we have now. But when we get it we are still not satisfied. This breeds an underlying angst and dissatisfaction, a feeling that we are constantly being conned. TV shows like Australian Idol have now created a fantasy world that claims to make any one a star or celebrity. In the disturbing film “Fight Club” * the writer puts these words into the mouth of Jack, one of the disillusioned young men trying to find some reality and authenticity in their empty consumer lifestyle through the violence and pain of the Fight Club. The idea is that only in this extreme experience can one feel really alive. We are the middle children of history – no purpose or place. There is no great war for us to fight, no great depression. Our great war is a spiritual war. Our great depression is our lives. We’ve all been raised on Television to believe that one day we’ll all be millionaires, and movie god’s and rock stars. But we won’t. We’re slowly learning that fact. And we’re very, very pissed off. Disillusionment can lead to depression, anger and violence, either directed inward to ones self or outward to others. It can lead to self medication through drugs or alcohol to relieve the pain or fill the vacuum. This may be one of the reasons why currently we have such an epidemic of drug and alcohol abuse and violence among young men. “American Beauty”* taps into this same theme of despair and middle class angst at the superficiality and ephemeral nature of the consumer culture where the wrapper seems to have become the reality. Quinton Tarantino’s films like “Pulp Fiction”*, “Kill Bill”, and “Inglourious Basterds” are intriguing but unsettling with their violence and postmodern, non linear story lines. Their references to other films point to the incestuous and self referential nature of the media. Is our ‘reality’ just a construction of the media like “the Truman Show?” Their ironic and dark humor reflects a feeling of the absurdity of our world and its absence of any meaning or truth foundation. These are artistic deconstructions of what we think is reality. To gauge the artistic world’s reaction we only need to note that Tarantino’s films have won almost every prestigious award: The Academy, the Golden globe, the Palm d’Or and the BAFTA. (Even the ironic ‘Scream’ Award in 2007!) Like the earlier cult classic “Blade Runner” (1982) “Pulp Fiction” continues the Post Modern theme with new energy. Another reflection of contemporary anxiety is the fear of Technology overwhelming us or blurring reality and virtual reality so we are confused about what is really real. This comes through in a number of recent films like “The Matrix”, “The Sixth Sense”, “The thirteenth floor”, “eXistenz”, “The usual suspects” and “Inception”. These examples show that the artistic production of dystopian prophecies and apocalyptic visions, and cries against man’s inhumanity and screams of despair are still very much with us in the 21st C., but they have a new edge, a new factor. We have moved from the loss of faith and angst of modernity to the confusion of post modernity. Not only does God not exist but there are no other foundations or objective truths and realities either. My interpretation may be quite off the mark and it may be that the children of the 21st C are simply indifferent, that the scream has been replaced by “whatever!” It is certainly true that by far the most viewed media today is computer games* and the most watched conventional films are fantasy like “Lord of the Rings” and “Harry Potter”! Perhaps as Neil Postman said of the 20th C post TV generation we are still just amusing ourselves to death. Quoting Camus or Orwell may not connect us to the cry of the 21st generation but exploring contemporary art and film may, particularly film. We need to remember that film, and electronic media is the principle way in which this generation receives its cultural and artistic expression. Once we have raised people’s awareness to what they are feeling and responding to, in a film like “American Beauty”, and identify what is being expressed, we have gained real insight and personal identification with their need or loss and so have achieved an experiential starting point for connecting them with the Gospel. This generation, unlike the previous may not know what they have lost but the vacuum, the absence is there, the longing is there. We will have to now work back from the ‘secondary losses they are aware of to the primary loss. All who mutter quietly or those who lift up there voices to scream their how’ll of despair at the world and life should ponder this statement. This is the real stark alternative to rejecting belief in God, or the absence of belief in the living God. 1. J G Ballard, ‘Miracles of life’ Harper Collins 2008, p157. 3. A. Saura, Exhibition notes on ‘Crucifixions Exhibition’ National Museum Cracow 29-27 July 2003. 4. R. Holloway,’Paradoxes of the Christian Faith and Life’ Mowbray1984 p29. The French Revolution in the late 18th Century began France’s great secular experiment. The age of Reason had arrived. Reason was now to be supreme. (Mind you it is worth remembering that it was ushered in with most bloody and frequently unreasonable actions!) Of the many extraordinary events that took place at that time one in particular stands out in my mind. On November 9th 1793 the Revolutionary Convention declared that God did not exist and that the worship of Reason was to be substituted instead. A woman wearing a veil was brought before the Convention, one of the Revolutionary leaders taking her by the hand declared – “Mortals, cease to tremble before the powerless thunders of a God whom your hearts have created. Henceforth acknowledge no divinity but Reason. I offer you its noblest and purest image; if you must have idols, sacrifice only to such as this.” Then the veil fell from the woman and revealed was the Paris opera singer Madame Maillard. She was then put on a magnificent carriage and taken by the crowd to Notre Dame Cathedral. There she was elevated on the altar to take the place of God and received the adoration of all who were present!” The next day a “Festival of Reason” was held in Notre Dame Cathedral – the church was declared a Temple of Reason and a stage and a mock mountain built inside the Cathedral crowned with a Temple of Philosophy. The elevation of Reason to this supreme place by the enlightenment led many Christians to be very suspicious of reason and intellectuals and philosophy. The 19th Century saw the rise of Biblical criticism, Darwinism and Scientific Rationalism – which reinforced these fears and suspicions. Christians also saw people in their own ranks so elevate reason and become so sceptical of emotions and enthusiasm that their faith became dry and arid, where the Holy Spirit was a proposition to believe rather than a person to know. So Faith and Reason became adversaries, not partners. But once Christians pitch faith and reason against each other we can expect to reap a very negative inheritance further down the track. that lacks a depth of knowledge and understanding. that develops a hyper or false spirituality that seeks to justify all decisions and actions on subjective guidance. restricted to the personal and private. does not engage the culture. while emphasising personal faith it fails to critique its own conformity to the culture it is part of. An evangelism that doesn’t engage the mind, that replaces argument with dogmatic statements. That fails to engage the intellectual idols of our day. That does not have the intellectual “grunt” for effective apologetics. He goes on to make the telling point that this was not true of the later movements of renewal in the first half of the 20 Century. The key people in these movements were evangelists like D.L.Moody, Billy Sunday and Charles Finney, who did not have the same depth of learning. This loss of intellectual command proved to be a critical weakness as secular humanism’s full impact hit the west like a nuclear bomb in the 20 Century. Among other disasters this led to the loss of control of the main stream seminaries to liberal reductionist theology – a legacy the church is still paying the cost of today. Theological colleges like Ridley College, founded in the1920s, were set up originally as alternatives to the official denominational Colleges that had been overtaken by liberal theology. (a) It leads to an intellectual reaction within the church that produces a reductionist liberal theology. Christians who have not had their serious questions addressed eventually throw the baby out with the bath water. (b) It leads to ridicule and dismissal by the general culture. (c) It leads to the loss of a generation of Christian young people who grow up without being intellectually equipped to deal with the withering fire of secular humanism when they hit university or the work place. As they leave the trenches of their homes and churches they are cut down without even returning fire. Bertrand Russell was arguably one of the great minds of the 20 Century. At 18 he had a faith but could find no one who would address his questions. Eventually he abandoned his faith and became one of the great protagonists for secular humanism in our generation. So what should our attitude be to faith and reason? Jesus gives us a clear starting point in Mark 12:28-34. We are to offer ourselves as living sacrifices to God – our whole life and person is to be set apart for God – this, he says, is our spiritual act of worship. Then in verse 2 he says we are to embark on the project of personal transformation by renewing our minds, and by refusing to let them be shaped by the patterns of this world i.e. the world that does not honour or serve God. We renew our minds by informing them with God’s word under the inspiration of the Holy Spirit and not just once a week in church! Do you spend as much time reading, thinking and discussing your Christian faith as you do all the other media you are surrounded by and saturated with? We live in an age where we struggle to swim in the tidal wave of information and images that pours over us daily. To constantly renew our minds with God’s truth in this context requires real intention and discipline. The tools, the books, the opportunity for fellowship and discussion and learning are all there. The decision is ours. Tolstoy has a great image in one of his novels that illustrates the difference between a Christian with a static view of Christian knowledge and one who continues to grow in the understanding and application of their knowledge of God’s Word. In the first picture we see a man standing under a solitary street lamp in a dark street. It’s the only light and it throws a circle of light around the lamp pole to which it is fixed. If the man walks too far from the pole he eventually walks outside the circle of light and into the darkness. He is free to do so but if he does he no longer has any light to show him a safe path. In the second picture we see a man carrying a lantern on a long stick. He is walking ahead confidently, the circle of light constantly accompanying him and lighting the way ahead. The Christian who is growing is the one who carries the light of God’s Word with them into all aspects of their life and is constantly using that light to shed understanding on the way ahead , constantly grappling with the complexities of life in the light of God’s Word, constantly seeking to understand it more clearly and more deeply as it applies to life and work, education and government, family and community, popular culture, etc. etc. In other words – faith and reason are partners not adversaries. That should be our attitude and practice. But this partnership is still incomplete without a 3rd partner – “obedience”. The ultimate purpose of believing and understanding is to love God and our neighbour – to obey the great commandment. The Christian faith is essentially relational. The essence of it is to be in a right relationship with God, a relationship of love, forgiven-ness and worshipful obedience . This is the relationship we were made for and so the one in which we are most fully human and most fulfilled. So faith and reason are meant to bring us into a relationship of loving obedience to God and love for others. Further, the biblical view of wisdom and understanding is profoundly ethical. It is not just about logical process and knowledge and cleverness but right action. Righteousness and wisdom are inextricably connected in scripture. These three ideas of relational faith, understanding (or wisdom) and obedience are summed up clearly in Job 28. What do these three ideas mean? Reason = a tool that assists us to know and understand God’s Word to us. Obedience = to do what God commands and calls us to . The last issue I want to look at briefly is the relationship between reason and revelation. By revelation I mean how and what God has revealed of himself to us in the history of his people, in Jesus and in the Apostolic witness to Jesus and the record of these things in the Old and the New Testaments – the Bible. The Christian who holds to classical orthodox Christianity will have a basic commitment to the Bible as God’s Word and as their primary authority. But this raises a key question: how are we to read it and interpret it? How does our trio of faith, reason and obedience apply to our study of the Bible? We come in faith believing God has revealed himself to us in his Word. But we come in “relational faith” ie. we come believing that God is in relationship with us through his Holy Spirit and he wants to communicate with us. So we expect to “hear” not just information about God but God’s Word to us, a word that will nourish us and transform us. within the rules of language and grammar and context and historical background. we seek to understand what the original writer was trying to convey under the inspiration of God when he wrote. Having understood, having “heard” – we then seek to obey – by reshaping our mind and attitudes to a Christian mind and by putting it into practice in our life. So our reason has a very important place and role. Reason only becomes a problem when it seeks to become ‘autonomous’. When it breaks away from faith and obedience. Eg. When we allow it to become an instrument to justify and rationalise a breach by us in our relationship with God or an act of disobedience or rationalise away some moral challenge we don’t want to obey. Remember our reason like all our faculties is affected by our fallen natures. It’s not as though we carry reason around with us like a mobile phone or a calculator, some self contained instrument that is unaffected by the rest of our nature that we can turn off and on like some objective tool. Reason will help us discover wisdom, and knowledge contributes to wisdom. But wisdom is bigger and deeper than reason or knowledge , it is knowing and doing what is good and right and true. So obedience must accompany faith and reason. Reason is easily seduced by the prevailing “plausibility structure” in society. A plausibility structure is what a culture at a particular time finds easy to believe , what’s plausible to it. Anything of course that fits the current plausibility structure seems reasonable and anything that doesn’t seems unreasonable! We always need a healthy scepticism about the prevailing plausibility structure because it keeps changing! Earlier I mentioned liberal reductionist theology. It is partly a product of the plausibility structure trap. It keeps reducing the Christian faith to fit what people find plausible. Instead of critiquing the current cultural thought with the Gospel it critiques the Gospel with the current cultural thought. The damage it creates in the church is increased by the fact that it continues to use the classical language and symbols of the faith but radically changes their meaning or evacuates them of their original meaning. By the time faithful lay people wake up congregation after congregation is ready for the body bags. Great tracts of the Anglican and Uniting Churches in this country have been destroyed by this or emaciated to the point where they are waiting for the ecclesiastical undertakers! Dr Graeme Cole used to say, “The alternative to theological liberalism is not fundamentalism but intelligent orthodoxy”. If fundamentalism is faith in conflict with reason and liberal theology is reason in conflict with revelation then intelligent orthodoxy is revelation, faith and reason in partnership, with revelation as the senior partner! Autonomous reason becomes completely feral when it begins to submit God to its own moral judgments. Reason is a good servant but a bad master. That’s a great motto – training a generation whose hearts are on fire with the Spirit of God, passionate for the Gospel but with minds ablaze, intellectually lit up and equipped to tackle the ideas and challenges of their culture. How much time each week, apart from church, do you spend developing a Christian mind? Reading, thinking about or discussing serious Christian material? What is the proportion in relation to the rest of your reading, viewing and thinking? If you have young teenagers – how intellectually equipped are they as Christians to face an aggressively secular university and work place? Are we doing enough as a congregation to intellectually equip our young people? There is a third world community development saying that goes something like this – “To feed a starving person is a moral obligation but if you teach him to fish as well you do an even better thing” – you create the possibility of self help and indigenous sustainable development. If we apply this as a metaphor to evangelism and mission in the local congregation or Christian organization the implications are as follows. While it is a good thing to point congregations and their leaders to specific and excellent evangelism programs like “Alpha”, “C.E” and “Introducing God” etc., it is an even better, more lasting and more contextualized thing to provide a frame work – ideas and tools – for a congregation and its leaders to develop their own evangelism and mission initiatives. They may well employ some of these programs or adapt them. They may also develop their own. But most importantly they will be far more likely to create a more comprehensive, locally relevant and sustainable approach if they develop their own strategy by starting with some basic questions, principles and research tools – a strategic frame work. Most of the off the shelf models are built around one particular strategy, e.g. : “Alpha” and “Introducing God” are attractional models, which is fine, but will only reach certain people. To reach other kinds of people we will need outreach models that work on their territory like the work place or the local pub or club. There are models that work through small or large group evangelism and others that encourage individual person to person faith sharing. Therefore the danger of being too directed by specific models is that it can restrict your strategy. Then there are the questions about wider mission responsibilities – are we tackling overseas mission adequately? Are social justice issues on our agenda? Are we involved in local community needs – are we a caring and compassionate community? 1. The leader must start first with him/her self. What are your attitudes to evangelism and mission? Do you have a passion, a deep concern in your heart? Are you personally involved in evangelism and mission? What experience have you had of personal or public evangelism? Do you need to become more informed? When was the last time you read a serious book on the subject? Check your library shelves – what’s there on the subject? What is your theology of evangelism and mission? Does your theology lead you to a deep commitment to it? You are going to lead this process if you are not deeply committed or up to speed it will not go far! Encouraging and training members in “personal evangelism” and faith sharing and raising consciousness about its importance in their everyday lives. Developing “attractional” evangelism through special events, guest-seeker services, and programs like “Alpha” on a regular basis. Developing “relational service groups” for pre- evangelism like play groups or “12 Step” Recovery groups, etc. Developing “Outreach” activities that work on the unchurched person’s territory like pubs, clubs, the work place etc. Developing “Compassion-reach”. Meeting local community needs. Ask the local community leaders “How can we serve you?” Create a caring community. Develop specialist contact groups like camping, business groups, a walking club, etc. Research your community for unreached people groups like new settlers, ethnic groups, etc. Ask your selves “Is the demography of our area changing do we need to start an Asian congregation or an ESL class? Developing an awareness of and addressing some social justice issues. Developing a responsible Overseas Missions program of education and support. Developing the % of the budget given to evangelism and mission beyond the congregation to a significant level. These areas will lead you into a comprehensive approach that is not limited by off the shelf programs. Of course you will notbe able to develop all these areas at once. 3. Remember that developing a healthy evangelism and mission approach in a congregation is complex. It is the product of many other factors being present – teaching, example by the leader, feedback to thecongregation through testimonies and stories reporting effective evangelism. 4. Analyze where the congregation is at in their attitudes, concerns, theology, practice, skills and training. Identify what needs to change and design a process and program. If their concern and attitudes are poor then it will take some time to change them. You will have to change their focus outward first through teaching, education, training and personal involvement. You have to create a new culture. 5. You will need to develop an outreach vision, a strategy and a plan for evangelism and mission. 6. This will involve new structures and organizations that create the means for people to become involved and express the new concerns that will emerge. You will also have to choose and /or develop methods that suite your area. Posted on Sunday, March 15th, 2009 at 1:55 pm. This weekend Melbourne has hosted an internationally publicized conference entitled “The Rise of Atheism”. The headline speaker is Richard Dawkins, biologist, author of “The God Delusion” and well known promoter of Atheism. Also the widely read English writer A C Grayling will be present, and the usual local suspects, Peter Singer, Phillip Adams, Catherine Deveny etc. Richard Dawkins is the current flag bearer for a new, articulate and very vocal group who has captured the media spotlight. They include the very talented and acerbic journalist Christopher Hitchens who has written “God is not Great”, a play on an Islamic chant. It was Hitchings who coined the phrase “Islamofascism” to describe today’s militant Islam. Then there is Sam Harris who has written “The end of Faith” and Daniel Dennett who wrote “Breaking the Spell”. They are sometimes referred to as the four horseman of the apocalypse! These writers have a common theme – religion is the main cause of division, violence and conflict in the world, it is, they say, the root of all evil, not only a delusion but dangerous to society. It is the enemy of reason and scientific truth. The enlightenment is under threat….it must be defended from deliberate attacks from organised ignorance. The passion with which they promote their views can be quite intolerant and narrow. Ironically these are the attitudes they claim to oppose. They also make some very sweeping claims. Eg: Dawkins implies that no scientist worth his salt could be a theist! In fact many of the worlds leading scientists past and present are Deists or Theists and many are Christians: Here are just a few examples: Max Planck (father of quantum theory) John Barrow (the theoretical physicist and current Professor of mathematical sciences at Cambridge,) John Polkinghorne (a particle physicist and a previous holder of the same chair at Cambridge), John Lennox (currently Professor of Mathmatics at Cambridge,) Simon Conway Morris (the Prof of evolutionary paleobiology at Cambridge, someone Dawkins should know well professionally), Francis Collins (head of the international Human Genome Project. ), Allan Sandage (the famous Astronomer.) Someone I know personally, Dr.John Pilbrow (emeritus Prof of physics at Monash Uni,) is a committed Christian. One could go on. In fact many of the academic and research scientists that I have known are not only theists but Christians. Now because a significant number of leading scientists and philosophers are theists or Christians does not prove the existence of God. But it does support the idea that belief in God is not unreasonable. It certainly runs counter to Dawkins implication that belief in God is something that only the uneducated, prejudiced, and intellectually feeble embrace. Dawkins is highly intelligent and it must be acknowledged that he and his associates present some very challenging and persuasive arguments in their books. Most interesting among the recent responses is the respected British philosopher Anthony Flew who for most of his academic career did not believe in God but has now changed his mind. Flews early writing was recognized for many years as part of the classic argument against theism. 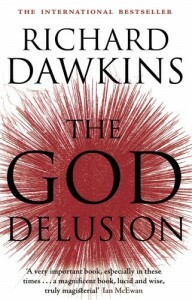 His recent book, in which he explains why he changed his mind, is entitled “There is a God”. The book is very significant because it explains how academic philosophy has moved on from the philosophical presuppositions of Dawkins and coy. They are really working from a now discredited logical positivism. The idea that – the only statements that are valid and meaningful are those that can be empirically observed, ie: tested and verified by sense experience, or scientific study and experiment. The effects of logical positivism have carried over into popular culture and remain widespread . Comments like “Well hasn’t science disproved the Bible and Christianity!” are typical. Every culture and period of history has what sociologists call a plausibility structure, ie: what the people of a particular time find plausible or easy to believe (and what they find difficult to believe.) Logical Positivism and its twin, scientific rationalism, have greatly influenced the plausibility structure of most contemporary Western people, even though they may never have encountered those terms, particularly people over 50years of age. Younger people who are more influenced by a post modern framework of thinking are often more open or flexible in their plausibility structure. They can flip easily between modern and post modern. Eg: the ease with which they embrace the idea of the spiritual and supernatural as well as modern technology. We will return to this idea of plausibility structures later. This phenomena, the rise of the new atheism, raises a number of questions that I’d like to try and address today. Is it a broad popular movement gathering strong momentum? What is driving this new militant and vocal atheism? Is there a significant decline in religious adherence in Australia today and is there a connection with the new atheism? And what should our response be as Christians? 2. Is it a broad popular movement gathering strong momentum? No! Not really although it has a high media profile. Those who choose conscious atheism is still a minority section of the population in the West. 68% of Aus believe in God or a universal spirit. In The Age poll 50% say religion is an important part of their lives. In the developing world belief in God in some form is almost universal and Christianity in particular has been growing rapidly for years now particularly through Pentecostalism. But also in the main stream denom’s. Eg: In Nigeria there are 11mill active Anglicans alone! Christianity is now the majority religion in South Korea. It is estimated that there are now in excess of 50 mill. Christians in China, and the Fallen Gong religious movement is also numbered in the 100’s of millions, and this in spite of years of active atheist propaganda and active suppression by the state. The factor of religion is now so important in international relations that Tony Blair has formed a special organization to harness faith in the service of international political solutions. So in the bigger picture atheism is not growing, in fact it is diminishing. But having said that there is definitely a decline in Christian adherence in Australia and the West in general. Non belief – neutral, never considered it, indifferent. Bishop Tom Frame in his book estimates that the majority of Australians are now in the category of unbelief, ie: they are ‘non dogmatic agnostics’, not really sure. I don’t think he is right about that. The research does not support that they are a majority, but I certainly think they are a large proportion now and growing. But the point is these people are not conscious atheists. In The Age Neilson Poll 24% say they have no religion or do not believe in God and the % is highest among the under 25’s (Gen Y) and going up. So is conscious atheism growing at the same pace as the decline of Christianity? No! But non belief and unbelief are growing (c’s 4&5) and the situation with the under 25’s deserves our close attention. 3. What is driving this new and militant group of public apologists for Atheism? (a) The rise of militant Islamic fundamentalism, the West’s reaction to it, and the increasing violence and suffering that has resulted. (b) The growth of “Creationism” (the young earth view) within Christian fundamentalism. (c) The decline in Christianity in the West. They smell the blood in the water! Let me develop these three and then think about how we should respond. (1) The bloody conflicts around the world and international terrorism have in most cases a religious factor. The response of the west has been described as a new crusade and is seen as such by many in the Muslim world. People like Christopher Hitchens see militant Islam in eg: its Iranian revolutionary guise or the Taliban in Afghanistan as the new religious fascism of the 21st C. They see it as the enemy of all we have achieved through the European enlightenment over the last 300 years. The running sore of the Israel / Palestinian conflict is deeply embedded in religious issues. The terrible conflict in the Sudan is between Islamic and Christian tribes. So it is very easy to frame an argument that religion is the great cause of evil, hatred and violence in the world, get rid of it and we will be free of the hatred and the violence and the suffering. But little if no attention is paid by these writers to the fact that the most bloody regimes in the recent past were militantly atheistic. It is estimated that over 40 mill people lost their lives in the atheistic, communist regimes of Stalin and Mao. A whole nation was traumatized and over 2.5 million lost in the Killing fields of Kampuchea by the fundamentalist Marxist Khmer Rouge, and no one knows what the toll is inside N. Korea. Therefore the idea that atheism will deliver us from evil, violence and mans inhumanity to man seems rather implausible when you reflect on its recent track record. Dawkins says that religious faith is the problem but I think he confuses faith and conviction. Unbalanced fanatical conviction that is driven by religion or atheism or a political ideology, that has no restraints or any moderating values like love and compassion, is frequently destructive. Nietzsche said “Convictions are more dangerous enemies of truth than lies”.G.K. Chesterton made a similar point when he warned “Beware of the well lit prison of a single idea” passionately held. Of course the truth is that it is the darkness in fallen humanity that is the cause of wars and hatred and the quest for power. “The heart of darkness”, as Conrad put it, is in us all. It is only the radical message of the gospel that is the answer to that darkness. Only Christ and the cross can both judge and free us from our evil and guilt. Only the transforming power of the Holy Spirit can change our hearts and enable us to live above our weakness’s. We can forget the clear NT statement that in Christ there is neither Jew nor Greek, slave nor free, male nor female but all are one – that the gospel calls us to a new identity that transcends race and culture. When we forget this we can fall back into the darkness. When we forget that forgiveness and reconciliation are central to the gospel we can easily embrace revenge and retaliation – When we allow faith to becomes aligned with a political ideology – then the darkness overpowers us and we too can resort to coercion and force rather than love. But when rightly understood and practiced the Christian faith transforms not only individuals but families, cultures, tribes and nations with love, forgiveness and reconciliation. On the other hand – Atheism offers no radical answer to the darkness in the fallen human heart. At its best it offers only the existentialist position – to will, to decide to do good in the face of evil, to fight the plague even though ultimately you know that it has no lasting effect or meaning, and you even have no objective way of determining what the good is. Like the Dr in Camus’ famous novel “The Plague”. You go on fighting the plague trying to save lives but in the end the plague wins. (2) The second thing driving the new atheism is the growth of Creationism within contemporary fundamentalist Christianity. “Creationism” is an interpretation of the Genesis creation account as taking place in 6 literal 24 hr days and rejects the Darwinian evolutionary theory and believes in a young earth (10,000 yrs, not Billions.) This has stirred up people like Dawkins who is a biologist. His other reason for visiting Australia is to promote his new book on evolution and Darwin’s work “The greatest Show on Earth”. Dawkins feels that Creationism is anti scientific and irrational and is taking us back to a pre enlightenment world view. It is worth noting that there are many thoughtful Christians who believe in divine creation and evolution and have some sympathy with Dawkins at this point. We need to make it clear that it is thoroughly Biblical to hold a view that believes in some form of evolution and a divine creator who designed, began and guided the process –God. (3) The third thing driving the new atheism is the decline of Christianity in the West. The new atheists sense this weakness and are moving in for the kill. I mentioned earlier that every age and culture has a plausibility structure ie: a mental framework that finds some things easy to believe and others not. The age of science bolstered by a philosophical frame work like logical positivism has made the believability of transcendent realities implausible for many western people. The idea that there is no absolute truth or absolute moral standard makes what Christianity offers no longer attractive and in fact it seems rather restrictive. (1) At one extreme we have had the liberal theological reaction of accommodation – of reducing core truths to fit the prevailing plausibility structure. Eg: If resurrection is unbelievable then redefine it as just the idea of Jesus coming alive in our hearts and minds. If Jesus’ claim to be Gods divine son is implausible then deconstruct the NT text to say that he didn’t really say that, this was what the early Christians wanted to believe and so they changed Jesus’ words. What he really meant is that we are all Gods sons and daughters. If the idea of atonement is too offensive to modern ears then re interpret the cross as merely a symbol of passive resistance to evil or a sign of identifying with us in our suffering. You can even retain the most disturbing symbols, like the cross and the Lords Supper, but evacuate them of their radical first order meaning of substitutionary sacrifice and turn them into some kind of feel good emotional spiritual mystery. Keep them clothed with traditional liturgy music and art and no one will know the difference! Or take the uncomfortable idea of judgment and accountability – that Christ’s call to follow him must be responded to and the failure to do so places you outside his kingdom. You can reinterpret it to a more comfortable idea that says everyone in spite of their personal decision will find their way into the Kingdom of God. The end result of liberal reductionism is of course a Christianity so emptied of its classical content that it has nothing radical to offer the contemporary culture. It is so seduced into conformity with it, so domesticated that it is unable to challenge the spirit of the age. Its ideas are now provincial, trapped in the mental landscape of the culture it inhabits.Instead of challenging the intellectual idols of its day with the gospel it submits to them. (2) The second response is at the other extreme.Fundamentalism! Creationism is one expression of this. Fundamentalism is a retreat from the intellectual challenges to belief. It is a result of pitting reason against faith rather than seeing it as a partner. It is a retreat into a closed certainty. 1. An intellectually shallow Christianity that is very vulnerable. 4. A shallow evangelism that fails to engage the mind. Gen. one has a living faith with moral practice but fails to pass on intelligent understanding. Gen. two has faith and practice but without intelligent understanding is unable to convincingly pass on vital faith, and so only passes on moral practice by example. By gen. three even moral practice is weakened because its foundation of vital faith and understanding has gone. As it no longer has these, and the example of moral practice is now compromised, it is unable to pass on any of the three key things. In fact it may even pass on a negative attitude, as a result of children seeing moral compromise. So gen. four has neither faith, understanding nor moral practice. So liberal theology or fundamentalism are two extreme responses that weaken Christianity. But we do not have to be limited to these two responses there is a third way. (3) The third response is intelligent orthodoxy alive with personal faith and infused by the Holy Spirit. That seeks to bring all the wisdom and intellectual resources from the history of the people of God to bear on the issues of the day. We have been in a battle like this before. Maybe in a different shape and context but the same questions re – occur. Classical Christian orthodoxy frees us from the provincial and present and lifts our horizons to the broad sweep of history and the treasures of Christianity’s intellectual and spiritual resources. (1) Do they have a meaningful alternative to belief in God? Ronald Aronson an atheist but one of the more measured critics of theism has written a book entitled “Living without God”. He makes the important point for his side to consider – “That living without God means turning to something.” What will that be? (2) Given the immense complexity of the universe and all living things, and the immense improbability of life happening on this planet in this solar system, why then is belief in a creator less probable than the idea of our origins being in blind chance? The burden of proof for the faith of atheism lies squarely with the atheists!